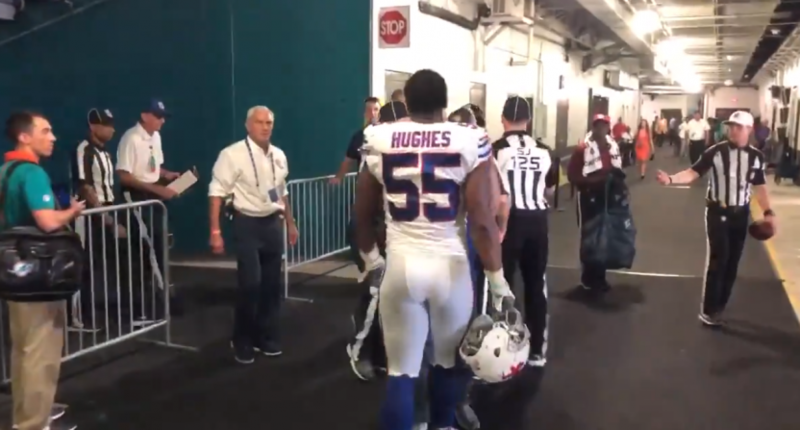 In an odd scene after the Bills loss to Miami, defensive end Jerry Hughes confronted an official in the tunnel and threatened him/challenged him to a fight. So, what’s happening here? Hughes may have decided he had nothing to gain by talking to the media about it, or he may have realized he was wrong and is hoping it all goes away. There’s also the chance he’s right, and an official did indeed provoke him. That’s not unprecedented; the most famous incident was probably when MLB umpire Mike Winters provoked Milton Bradley by swearing at him. Winters ended up suspended for it. Regardless of the provocation, it seems likely that Hughes is going to face some kind of punishment for the confrontation. Hopefully the league investigates his allegation, too, if he ever gets around to making it again.